It only takes a few days in Costa Rica to quickly realize that many towns and beaches in the country go by the same name. Playa Hermosa, which translates to Beautiful Beach, is no exception. There’s one in Guanacaste and another just north of Jaco—and those are the ones we know of off the top of our head! 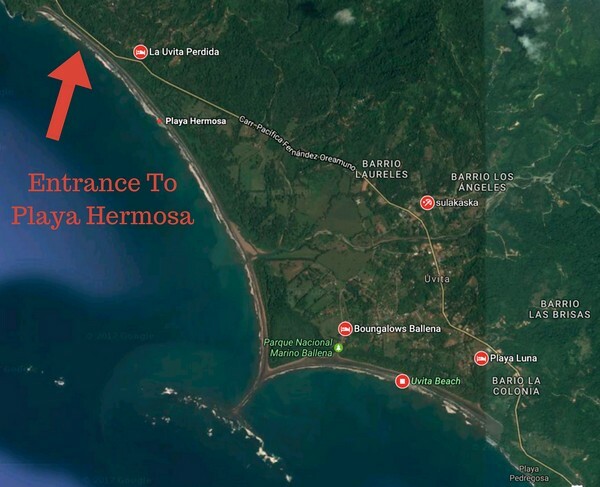 Located between Uvita and Dominical, it’s all too easy to drive right past the entrances to Playa Hermosa if you don’t know to look for it. There’s nothing more than a small wooden sign at one turnoff—and nothing at all to mark the other. 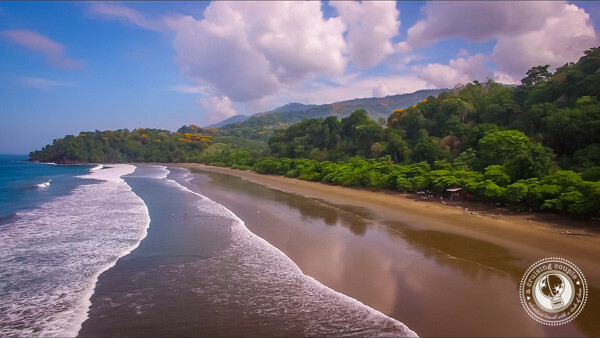 However, Playa Hermosa is a gem that’s well worth seeking out anytime you’re traveling to Costa Rica’s South Pacific. Playa Hermosa is perhaps most popular for its consistent surf break. The waves are a bit more manageable than Dominical, making them a particularly good option for intermediate surfers. Playa Hermosa is actually Dan’s favorite spot to surf, and more often than not, it’s where you’ll find him enjoying a quick morning surf session. 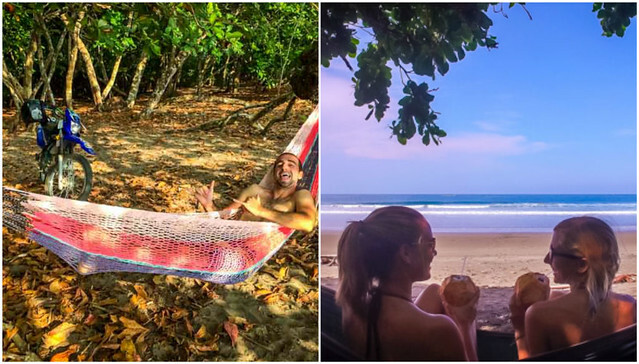 Of course, there’s more to Playa Hermosa than surf alone. The brown sand beach is absolutely gorgeous, especially during low tide when there is ample space for long walks or runs. Be sure to look back at the lush palms and mountains that frame the beach, truly making Playa Hermosa feel like a secluded paradise. Low tide is a bit more manageable for swims, but there are strong currents and the potential for rip tides, so it’s not a suitable spot for beginner swimmers. Always stay aware and don’t head out too deep. Luckily, our community is very fortunate to have excellent lifeguards at Playa Hermosa, an initiative that’s funded by donations from local businesses, residents, travelers and community fundraisers. 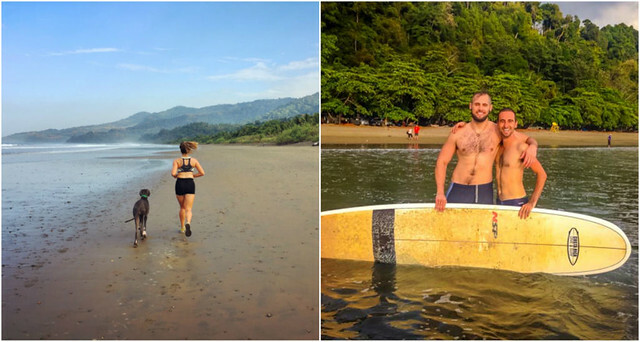 You can learn more about the awesome lifeguards keeping you safe at Playa Hermosa (or donate if you feel so inclined) here. 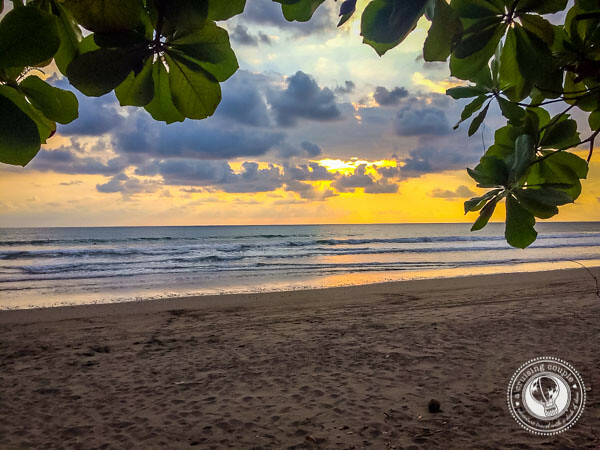 Once you’ve had enough sun, sand and surf, Playa Hermosa makes an excellent spot to laze away in a hammock while soaking in one of Costa Rica’s legendary sunsets. Bring along a cooler with Imperials, the local beer, or grab a fresh pipa (coconut) from one of the stands to top it all off. Apart from a few stands selling fruit, ceviche and sarongs, you won’t find much in the way of vendors or facilities. There is a fresh water shower and some lockers you can pay to use (about $1 USD), but we have yet to use them ourselves. Extra Tip: If you’ve read any of our articles on Costa Rica, then you’ve heard us say never to leave any belongings unattended on the beach or in your car. Unfortunately, petty theft is common throughout Costa Rica. Playa Hermosa is just 10km from Dominical and 5km from Uvita, making it a convenient stop on any visit to Costa Rica’s Costa Ballena. In fact, this is one of the reasons why we love where we live so much: we can easily enjoy the best of both popular towns without feeling pigeon-holed into one or the other. If you’re looking for a convenient hotel that’s close to Playa Hermosa (and therefor also offers the same central benefits), then we hands-down recommend Tiki Villas. This is the hotel where we always send friends or family if for some reason they won’t be staying with us. The bungalows are simple yet elegant, with large doors that open out to the jungle and ocean views. The restaurant, Jungle Blue, is one of the best in the area. And the small pool is one of our favorite spots to sip on a martini while searching for toucans and monkeys in the surrounding trees. Note that there are no hotels “on” Playa Hermosa. It is possible to walk from Tiki Villas, however, you will definitely want a rental car if you are traveling and exploring Costa Rica’s South Pacific. There isn’t a lot of signage for Playa Hermosa so you’ll have to watch carefully. There are two entrances to get to the beach parking. 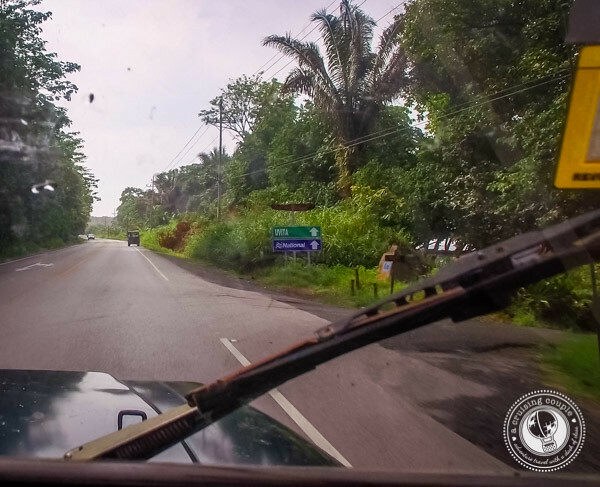 When coming from the North there is a small wooden sign that reads “Playa Hermosa” which sits above 2 metal signs for Uvita and National Rent A Car. The second entrance is about 200 meters past the first. Coming from Uvita you won’t see any signs but it is roughly 5 kilometers, a 6 minute drive down the Costal Highway. You can get exact directions here. We might be a bit biased due to our proximity, but we think Playa Hermosa truly is a spectacular beach that’s worthy of its name. What about you? Have you visited the Playa Hermosa in Costa Rica’s South Pacific? Find This Post Helpful? Pin It! Why yes, I have visited 😉 I personally think this is the best beach ever and I can’t wait to visit it again! Surfing, sunsets, Imperials, Hammock time, dogs running around, picnics, plenty of pipas…I’m ready!